Q1: What is SHC’s mission? 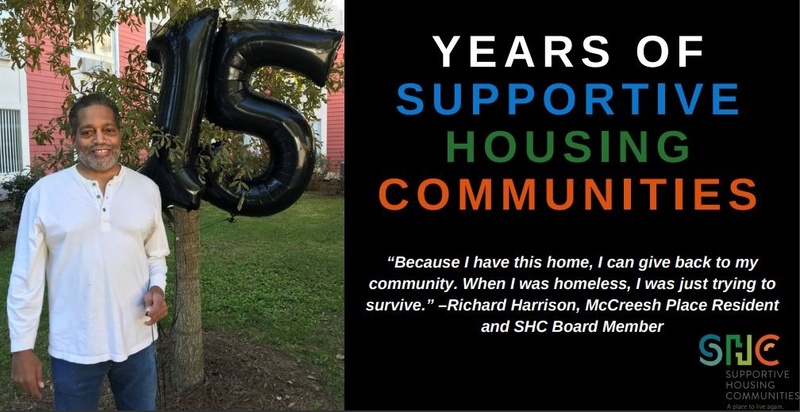 SHC’s mission is to provide affordable housing to alleviate homelessness and human suffering. In carrying out this mission, SHC prioritizes the needs of the chronically homeless. Q2: Who are the chronically homeless? By definition, the “chronically homeless” are those who have been homeless for at least a year (either continuously or episodically for a total of at least a year) and also have at least one diagnosed disability. Approximately 82% of our residents were chronically homeless. The remaining 18% were also highly vulnerable but had been homeless for less than a year. Q3: So what does SHC do to help the homeless? Are you basically just McCreesh Place? Q4: Scattered Site, Rapid Rehousing, PATH…I don’t know what those words mean. Can you explain it to me in terms that I can understand? Okay, sorry, of course, yes! Let’s start with the Scattered Site Program. So basically there are two big differences between the Scattered Site Program and McCreesh Place. First: at McCreesh Place, everyone lives together in the same building. SHC owns this building. We built it. By contrast, in the Scattered Site Program, residents live all over the place, in many different privately-owned rental units “scattered” throughout the city—hence the name of the program. Second: McCreesh Place is designed for residents in recovery from addiction, but the Scattered Site Program is based on a “Housing First” model. Practically, that means residents at McCreesh Place are expected to abstain from alcohol (and other illicit substances) while residents of the Scattered Site Program are not. One of the main ideas behind the Housing First model [for ending homelessness] is that sometimes people need a place to call home before they can make other important changes in life—such as drinking less or overcoming substance dependence. Q5: Okay, I think I understand the Scattered Site Program well enough. What’s Rapid Rehousing? Rapid Rehousing is another form of Scattered Site housing. As part of the Scattered Site Program, Rapid Rehousing places residents in many different apartments “scattered” throughout Charlotte. What distinguishes Rapid Rehousing from the rest of our Scattered Site Program is the presumed duration of support. The rest of our Scattered Site program provides permanent support. In the Rapid Rehousing Program, by contrast, the supportive services are presumed to be temporary—and designed to transition residents to self-sufficiency within a period of two years. The main idea behind Rapid Rehousing (and Housing First) is that placing homeless persons in housing right away can often break this dreadful downward spiral in which you can’t get a job because you don’t have a home, and you can’t afford a home because you don’t have a job, and if you don’t have either a job or a home it’s almost impossible to make progress in any other areas of life (such as overcoming a drinking problem, for instance, or a mental illness). You can get stuck in a hole which is more like quicksand because if you do nothing you just keep sinking deeper and deeper down. By providing supportive housing right away—i.e., rapidly—our Rapid Rehousing program breaks this cycle. With this secure foothold, you can begin to dig yourself out of the hole—generally in a period of two years. Q6. That makes sense. But now I’m wondering—why don’t you use Rapid Rehousing for all your residents? I mean, why don’t you try to transition everyone to self-sufficiency? The population we serve is extremely vulnerable. Everyone who comes to us has a diagnosed disability and most have been homeless for more than a year. Many have a history of trauma, including physical and sexual violence, which has been intensified by living on the street. Given their extreme levels of vulnerability, many of our residents require permanent support. Furthermore, many of our residents receive disability benefits which limits their income to $700-800 per month. They cannot live self-sufficiently making this much. That said, we are taking proactive measures to maximize the number of residents who become self-sufficient. That’s the point of our Rapid Rehousing Program. We take chronically homeless individuals with a lower vulnerability score (as measured by a widely used psychometric test—you may have heard of the VI-SPDAT?) and place them in Rapid Rehousing. By studying their successes and shortcomings, we are trying to determine the threshold of vulnerability below which one stands a good shot at transitioning to self-sufficiency. Of course, it varies from person to person. Q7. What’s St. Johns Place? St. Johns Place is our newest program—or rather project, since it is kind of larger than one program. The short answer is that St. Johns Place is an apartment building we purchased and renovated in 2017 to provide affordable housing to clients of partnering organizations. The longer answer requires me to get into the recent history of SHC. So, St. Johns Place used to be just another neglected apartment complex on the outskirts of The Plaza. Neighbors complained about the rundown building and unruly residents. Usually people resist any effort to house the homeless “in their backyard.” But because of the poor reputation of St. Johns Place, we were welcomed with open arms when we came into the neighborhood, purchased the place, renovated it, and then staffed it with a team of our case managers. Due to a conflict of interest, we can’t house our own residents at St. Johns Place. (That would involve using government funds to pay rent to ourselves.) So instead we rent units to the most vulnerable clients of partnering organizations such as Urban Ministry Center and Mecklenburg County Shelter Plus Care. Given the shortage of affordable housing in Charlotte, they are grateful to have landlords like us who will work with them to making housing affordable to their most vulnerable clients. Q8. Wow, that’s quite an operation. Do you have any plans to purchase and renovate additional property or was that kind of a one-shot deal? So glad you asked. Our Expansion Committee is actively working on a plan to recreate this success. With St. Johns Place, we identified the property first and then launched an aggressive capital campaign to fund our purchase. This worked only because the property owner was very patient with us—we had to request (and were generously granted) six different extensions before we finally closed the deal. But most property owners won’t be that patient. Which is why this time we are trying to raise money before we set our hearts on a particular property. Q9: You also mentioned a Street Outreach team. What do they do? Yes, SHC also has a street outreach team through the national Projects for Assistance in Transition from Homelessness (PATH) program. We call it the PATH Program. Our six-person “PATH team” spends their days building relationships with unsheltered homeless individuals. Through these relationships, they reestablish trust in the social services system. They try to connect their clients to much-needed mental health resources. The long-term goal is to help them find housing—either with SHC or another partnering organization. Q10: How many people do you serve in these programs? During our most recent fiscal year (July 1, 2017 – June 30, 2018), SHC served 678 unduplicated people. 300 (235 adults and 65 children) of these were provided with housing/support services, and we will break this number down even further right here. 101 were provided with permanent supportive housing at McCreesh Place and St. Johns Place. 127 were provided with permanent supportive housing in Scattered Site Housing. 48 were provided with rapid rehousing in Scattered Site Housing. 24 were provided with case management services for street outreach clients. Our street outreach team falls into a different category. They provide less intensive services to a larger number of people. Last year, our street outreach team connected with 402 people. In this context, “connecting” might be just a conversation or exchange of one of our gift bags. But sometimes these conversations develop into more intensive case management. Q11: Do you basically serve just men? No! It’s true that the majority of our residents are men. This reflects the demographics of the broader homeless population, of which the majority are men. It typically breaks down that 80% of the residents served by SHC are male. Q12: I think I understand the programs well enough. Let’s talk money. What’s your budget? Nice, a straightforward question! For the upcoming fiscal year, our budget is $3,120,819. That number refers to our income. Expected expenses are $3,083,804. Q13: Wow, that’s a lot of money. Where does it come from? We get our money from a variety of sources. 33% is from government grants. 20% from rental subsidies. 15% from rental income. 10% from individual donors. 10% from foundations. 7% from corporations. 5% from faith organizations. Less than 1% is from investments. Q14: Why do you need more money? We need more money because our programs continue to expand. For example, Charlotte Housing Authority notified us that we will receive between 15 and 30 new vouchers in 2019. These vouchers necessitate a corresponding expansion of supportive services. As mentioned above, we are also beginning to raise funds to purchase more property. The shortage of affordable housing is one of the root causes of homelessness in Charlotte. We want to purchase and renovate more property to address this root problem. Finally, we need more money because the rental rates in Charlotte continue to skyrocket. We must keep up with the rising market rates because our residents (whose rents we subsidize) cannot. Q15. How can I donate money? Ha ha, that’s actually not a frequently asked question—unless we’re the ones doing the asking. Thanks for making the first move. If you want to support us, the easiest way is to make an online donation by going to our website and clicking on the orange Donate button. Alternatively, you can call or email Kelly Lynn (704-593-3053 or kelly@aplacetoliveagain.org) to discuss the details or the nature of your pledge.